Mail4Rosey: Engraved Photos on Dog Tags for Father's Day! If you're looking for something unique to get dad for Father's Day, how about a picture of the kids on a dog tag necklace? It's 'manly' while still sentimental, and it's definitely a cool idea. I've mentioned before that my daughter is artsy, and that spills over into everything that she does. It comes very easily to her, which is a marvel to me, because I do not have her talent. About a year ago she designed a picture of herself that I thought was different, in a good way. She's standing on a road, with leaves on either side of her, and she raised a foot to the upper part of her leg, touching her temples on either side, and then photo filtered it so it looked almost ethereal. The end result was memorable, as are most things that she does. I saved that picture, knowing I wanted to do something special with it some day. Well that day has now come. 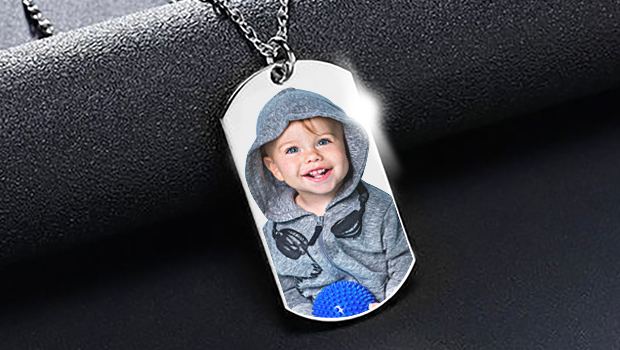 I turned the photo in to Pictures on Gold (via an e-mail attachment), a company that engraves your picture right onto a necklace, which can be a locket (silver or gold), or specialty item such as this dog tag. I think it's a perfect gift idea for dad! This photo is meant to be lighter, that's the way it was made. You can get a vivid print too, if you like (see below). The photo you send prints the way it looks (if it's faded, it prints that way of course, and likewise your clear photos will be brilliant). I honestly couldn't be happier with the end results. This is our second time ordering from this company (we ordered a locket once upon a time too), and they are absolutely stellar for quality and good looks. I highly recommend them any time of year, but most especially right now, for creating a unique present for Father's Day. "Personalized Photo Jewelry PicturesOnGold.com creates the finest Photo Pendants and Charms, Gold Lockets, Silver Lockets and other Personalized Photo Jewelry in the industry. We create lasting photo lockets and photo jewelry keepsakes using only the finest 14k gold, white gold and Sterling Silver. You send us your photos and using our patented technology we laser engrave your pictures in color right on our gold lockets, silver lockets, locket charms and most of our custom jewelry. The results are gorgeous gold lockets or silver photo lockets that open to reveal your photos and can be worn as a beautiful photo or picture locket." Mail4Rosey Readers Save 10% off of any order! - Use code "famguide10" to save 10% off your order at http://www.picturesongold.com Not to be used with any other offers or discounts. This is precious and an excellent gift for Dad or Mom, G-ma or G-pa. This is such a beautiful gift idea! I remember my nieces gave their dad a photo tag for Christmas a few years ago, and I thought it was such a brilliant idea! That is a neat idea indeed. I'm with you, when it comes to art, sure don't have what the artsy types have. They see things a whole other way. How exciting that your daughter is so creative. I like her picture on the dog tag it is an outside the box type photo. The other picture is darling and it looks like Pictures On Gold did an awesome job with it. Its not to late I should check them out right now. I love this dog tag pic. Sadly, non of the fathers are into this. Thanks for sharing! Personalized photo gifts are always appreciated and very sentimental. Oh! This is such a fun idea. And it's a piece of jewelry a dad might actually wear. Such a fun choice for sure! Oh my goodness this is the absolute cutest idea ever! I totally love this gift idea!!! This is such a lovely idea for Fathers Day, it is adorable and I am sure it will make dog loving dads so happy! That's a neat gift idea. Those tags are just way too adorable. Absolutely a perfect Mother's or Father's Day gift. Oh what a cute gift idea for dads! I think my dad would love this with a photo of my cat (not joking lol). These are super cute. They would be a great gift idea. What a special gift! I can think of some really great uses for this, that are not on fathers day too. Wow this is a nice idea for dog tag and i do love it its a best for fathers day present.